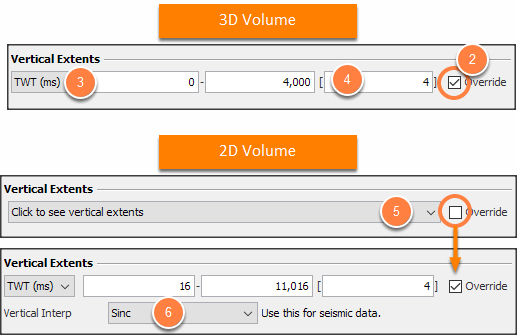 You can export a 2D or 3D volume to the SEG-Y format so that it can be used in other applications. If a velocity volume is configured for the session (see Converting Time-Depth), the data can be exported in time or depth. Note: You can also export volume in the flattened domain to SEG-Y. See Edit SEGY Header for more configuration options. Click Edit SEG-Y Header to open the SEG-Y Text header editor (optional). See Editing SEG-Y Text Headers for details on customising SEG-Y headers. Don't split (default): Export as a single SEG-Y file. Horizon data, such as water depths, can be stored in trace headers as the data is exported. Click the blue "+" icon to add horizon data. This option is only available if you have horizons loaded in the session. Click the red "x" icon to remove. Select the trace Header to store the horizon value. Tick Zero if Missing to use zero for traces with no corresponding horizon value. If unchecked, the export will stop with an error when traces cannot find a horizon value. Deselected Override will use the extents of the existing volume or line. 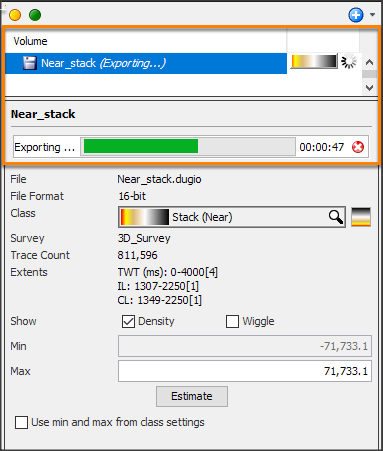 Check the Override box to change the vertical extents of the export volume. Define the vertical extent and its increment. For 2D volumes, click this dropdown to see the vertical extents of each line. Select the survey for the exported volume. Volumes can be exported to 3D surveys or along 2D lines/2D line-sets. Define the IL and CL range to export. For both 2D and 3D, the extent settings default to native extents and sample rates. If you change the extents or increments, samples will be interpolated (but not extrapolated) as necessary. Under the Line column, toggle the traffic light to select (green) or deselect (amber) which 2D line to export. By default, all lines are selected. Click the Set Spacing button to define the CMP Extents. The increment of the listed lines will update automatically based on values configured. Set ensemble X/Y from Survey: Set the trace ensemble X/Y headers with X/Y values from the survey. Note: Insight writes the X/Y values from the survey file to the ENSEMBLE X (cdpx) / ENSEMBLE Y (cdpy) headers at bytes 181 and 185, respectively. When writing, the export will honour the navigation scalar (scalco) on the trace, as seen in the View menu under Headers.